I wrote this article many years ago when Clem was still alive and almost by accident picked it up on Facebook. I find it hard to believe it was 12 years ago that this extraordinary man died but as I survey the ongoing slaughter of the wildlife that he did so much for I feel it’s still well worth posting this with a few changes on the original. It is only one of many tragedies that have ensued since Rhodesia became Zimbabwe but the destruction of the Department of National Parks and Wildlife is one that has gone somewhat unnoticed as the full scale of the humanitarian and political disaster has revealed itself. The organisation that Robert Mugabe took control of was the best of its kind in Africa and arguably as good as any in the world. An unsung, reluctant hero of that service was a self-effacing, publicity-averse man by the name of Clem Coetzee. Today he is now more alone against the odds than ever. Evicted from his land in the Lowveld of south-eastern Zimbabwe like most of his compatriots, he has had to sit silently and watch government supported thugs invade his property and destroy his life and livelihood. All he has so carefully protected and nurtured is devastated. Febrile life is replaced with death and dereliction. But his personal plight is of little consequence to him and he does not dwell on it. It is the sacking of the country and the wildlife that moves him. “We’ve had highs and we’ve had lows in this country but this is by far the worst. Worse than the war, when we could defend ourselves and protect our homes and properties. I cannot believe the destruction. I don’t want to travel the country anymore because I cannot bear to see what they are doing,” he says. I have known Clem since I was a little boy. Some thirty years later he has changed little. Medium height, muscular, a handsome man, sharp features and soft, sparkling blue eyes below bushy brows. Trademark sideburns curl down the side of his face. Everything is about making do with the minimum; shorts and cotton shirt; shoes are invariably dispensed with unless absolutely necessary. Restless and driven. He has little interest in conferences and talk-shops unlike the people who have replaced him. No talk the talk – let’s walk the walk. A genuine man of action who makes up his mind quickly and decisively and implements the plan as he goes along. Born in 1939 in Rhodesia of Afrikaner stock he gave up a promising engineering career to join the Parks service as a Junior Ranger in 1965. Even in those days the Department was low down the list as a budgetary priority and the rangers and wardens made do with little. Salaries were poor but none had joined for financial reward – they were there because they were dedicated to a cause and they loved the life. “There were times when we had no fuel to go out on patrol. We used to buy it ourselves. Swap elephant meat with other government departments to get spares for our vehicles but we always made a plan.” Indeed they did. Coetzee is dismissive of the emphasis on helicopters, aircraft and other expensive hi-tech equipment called for today to combat poaching. Clem and his Management Team. His move up the ranks was quickened by the deaths of seniors; Warden Len Harvey, killed in Wankie by a lioness which jumped into his house at night and his replacement, Norman Payne gunned down by ZANU PF insurgents. Leaving the Valley, his posting was to Management Unit, the mobile, operational arm of the Department responsible for, amongst other duties; all population reduction exercises (culling), problem animal control (PAC), fire control and game capture and trans-location. This period saw the Research arm of the department coming up with statistics demanding a radical reduction in elephant numbers, particularly in Wankie. The European settlers had created a big problem here. In the early days of Rhodesia the area had posed a dilemma for the government because it appeared suitable for nothing. Seasonal water, poor soils and little game left the authorities in a quandary when a gentleman by the name of Ted Davidson suggested boreholes pumped by windmills would solve the water problem and make it an attractive refuge for wildlife. He was right but the end result was the plan succeeded too well. With human population pressures growing elsewhere and the establishment of a well managed protective zone, game flooded into the area and the eco-system began to struggle with the artificial pressure. Elephant, being particularly destructive, played havoc with the ecology and the conclusion was their numbers had to be dramatically reduced. Much of this particularly unpleasant task fell to Coetzee who dislikes discussion of the details but there is little doubt he has hunted and shot more elephant than any man alive and is demonstrably unimpressed with this fact. Coetzee remembers those days well and not without sadness. “I often think about Tim,” he says, referring to Tim Wellington, one of his rangers who he lost in the process. “We had to go after a wounded bull and I was sick. I had Bilharzia and I was having treatment which hammers you, and I was battling to keep up with him in the heat. We had the tracks and it was just a matter of time before we caught up with the elephant but I decided to let Tim go ahead alone. I heard a commotion and when I got to him he was still alive but a complete mess. He had been tusked, raked through the bush for about 20 metres and crushed into the ground. We got a chopper but it was too late. I think he had a misfire.” He finishes relating the story and looks down at the floor; he is quiet and lost in thought ruing a decision made at another time in another place. Then he puts it in context. “But you know,” he looks up again, “during my time in Parks I lost nine of my friends. Three in the war, and six in the course of Department duties. The job took its toll.” Clem’s salary peaked at the equivalent of £150 per month. Anxious to find a way of resolving the population crisis without killing more elephant he pleaded for attention to be given to capture but there were problems with this. It was expensive, it was a complex process about which little was known and there were few alternative locations to move the animals to. Tragically, the elephant to the north in Zambia were, at that time, in the process of being decimated by poaching leaving a vacuum but politics and security precluded that possibility. Coetzee refused to take no for an answer and plugged away. Astonishingly, for a man with no scientific training whatsoever he came up with all the right answers on drugs, equipment and how to actually manage animals of this size and physiology when under the influence of narcotics. 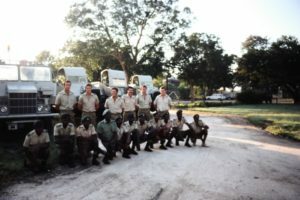 His techniques improved steadily, culminating in what he says is the greatest achievement of his career: moving an entire breeding herd from Zimbabwe to sanctuary in South Africa within 24 hours without a fatality. Loading and moving live elephant had never been done on this scale anywhere in the world. “I really am proud of that,” he says. “And then with the drought in ’92 we saved hundreds from dying.” His face lights up when he recalls the events of this period. But lurking in government offices was an enemy he was not familiar with and against which he was almost defenceless; the politicians and law enforcement officers who had ridden into town with Mugabe. Armed, dangerous, and powerful, their eyes were on the ivory and the rhino horn. Coetzee the custodian, was too honest, too committed and too professional for them. He had to go. Harassment duly commenced and he was accused of all manner of criminal activity. Indicted numerous times on trumped up charges, his home was ransacked and he was arrested but despite determined efforts his persecutors could prove none of the charges they preferred against him. One, so ridiculous, it is almost funny; smuggling 200 elephant through Beit Bridge border post in broad daylight with no one noticing. Although no longer a civil servant his problems with the politicians continue to this day. Despite all the setbacks he is resolute. “I’m not going,” he says, “I’m not leaving this country. We have to see this through. We have to stick it out and then try and pick up the pieces.” Blue eyes fire up. “This Transfrontier Park plan,” he says referring to the budding plan to fuse areas of South Africa, Mozambique and Zimbabwe to create a contiguous protective zone, “maybe they’ll leave me alone and let me get back to work on something there?” He looks for confirmation of this opinion. I wish I could give it. I am wistful and sad. He never did claim to understand the deceit and deception of the political world. His brief never was to reason why. He knew the difference between right and wrong and thought he was right but in the African context, he was wrong. The quiet man with the huge heart and big ideas but outnumbered and out manoeuvred. Decisions were being made elsewhere and he and his small band of men were destined to be swept aside by the surly winds of political change. “This is my Zimbabwe,” says Mugabe, and so is all the game. Hope that help might come from outside has been dashed. A limp-wristed world shrinks from confronting African despots because no rules apply to them; the liberal establishment has convinced the world everything is the fault of the colonials. Mugabe has the green light to go on killing and destroying with abandon. In the midst of the mayhem, precious animals that so long had Coetzee to shield them from a predatory people must try to survive without one of their devoted protectors. During his absence from the killing fields of Zimbabwe it is sad but certain that many more of the animals to which he has dedicated his life are certain to die. Previous Post Lords of the Lies; David Owen and Peter Carrington. Next Post Ashwin Willemse; Who Was Victimised?